Kerrville and Texas Hill Country Homes and Commercial Property for sale. 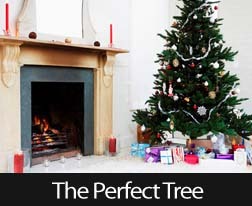 Measure where you’re going to place the tree in your home, from ceiling to floor. You’ll want your tree to be at least a foot shorter than the ceiling, so take a measuring tape with you when you shop for your tree. When measuring for height, adjust for the star, angel or topknot that you’ll be using; most can add as much as twelve inches to the height of your tree. Measure the opening of your tree stand, so you know how wide the base of the tree can be. The base of the tree should be straight and at least six inches long to fit nicely into your tree stand. Run your fingers along the needles of the tree you’re looking at, and give the tree a shake. Very few needles should fall off. For the best shape, full branches, rich color and good needle retention on trees, choose a Balsam fir, Douglas fir, Fraser fir, Noble fir or Scotch pine. Buy as soon as you can for the best quality, or wait longer for best price. After you get it home, cut an inch off the base so your tree can take in water more easily. Make sure the cut is straight. Use a stand that holds at least one gallon of water. Make sure you water your tree often. This keeps the needles from drying, as well as keeping the fragrance strong. Check the water level every few hours. Don’t add anything to the water – no aspirin, soda water, bleach, etc. – to keep it fresh. According to the experts, lots of plain water is best. Keep cheerful Holiday spirit alive by having the perfect Holiday tree in your home, one that’s lush and brightly decorated. Want a new home to decorate? Call your trusted real estate professional. Have a Happy Holiday! See the value of your home. Receive a regular trend report on your neighborhood.